The Agriculture Improvement Act of 2018 (2018 Farm Act) was signed into law December 20, 2018, and will remain in force through the end of fiscal year 2023, although some provisions extend beyond 2023. 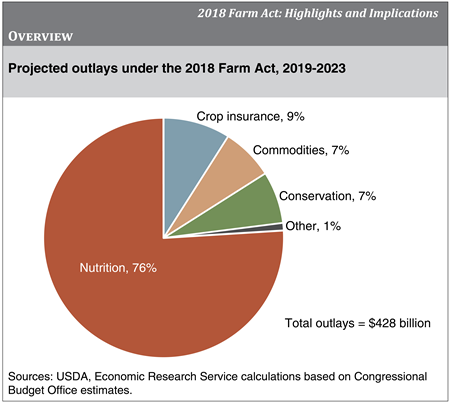 The Congressional Budget Office (CBO) projects that the new Farm Act will mandate spending of $428 billion dollars over the next 5 fiscal years (2019-2023). A large majority of projected spending�76 percent ($326.02 billion)�will fund nutrition programs, with most going to the Supplemental Nutrition Assistance Program (SNAP). Crop insurance ($38.01 billion), farm commodity programs ($31.44 billion), and conservation programs ($29.27 billion) account for nearly all of the remaining outlays. Approximately 0.8 percent ($3.54 billion) will fund all other programs, including trade, credit, rural development, research and extension, forestry, energy, horticulture, and miscellaneous programs. Overall, the new Farm Act makes fewer changes to food and farm policy than the 2014 Farm Act. Nutrition policy, particularly SNAP, will continue with minor changes. Crop insurance options and agricultural commodity programs will continue largely as under the 2014 Farm Act. All major conservation programs will continue, although some were modified significantly.